So after the nearly full moon in the last post, it then clouded over for the better part of a week, denying the oppourtunity to photograph the full and waning moon. I'll just have to try again next month. Aside from the obvious (to me anyway) accuracy fails with the Apollo spacecraft, and the clever (if misleading) use of real footage, it is remarkable how Bay's depiction of the astronauts looks almost nothing like the real footage, in more ways than are obvious. Not that I would expect accuracy or realism from a Bay movie, but it is an interesting theory tester, and hopefully might convince a few hoax proponents of the lunacy (pun intended) that the hoax theory is. On the other hand, it might inspire a whole new wave of people who don't know any better to fall for the poorly researched, utterly discredited non-science woo that sadly still undermines one of our greatest acheivements. Vaccine denier gets owned on Sydney radio by host in possession of actual facts (link). Okay so it is a bit of an ambush, and the host doesn't even pretend to be unbiased, but it makes me smile to hear bad science taken apart like this. Dire Straits now officially offensive after decades of being one of the safest rock bands ever. I get that a throwaway lyric that is actually a quote, in a song that is a parody of both the quoted and the thing he was referring to, could be considered to be offensive language. But I don't why has it taken twenty five years of virtually continual airplay of a song that was the biggest hit off a monster album (including a radio edit produced at the time of the original release that doesn't feature said lyrics, after they caused controversy then) before anyone got riled up enough about it to officially complain. Again. Especially when there are far more and worse examples of homophobic or otherwise derogarotory or potentially offensive lyrics and themes in other innocuous sounding hit songs. The Taupo McDonald's features an extra dining area in the form of a retired DC-3. I'm not sure if this is awesome or completely undignified, but at least it is still around. It is actually a reasonably historic airframe (with even a compiled history listed here ). 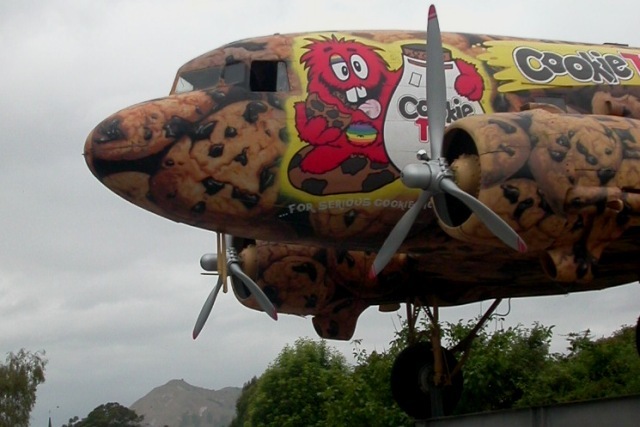 Besides being a veteran of the pacific second world war with the US and Australian Air Forces, it was used by SPANZ (South Pacific Airlines of NZ (wiki) ) in the 1960's to unsuccessfully challenge the then government owned airline monopoly in NZ. As an enticement to travel, particularly with tour groups in mind, SPANZ DC-3's were fitted with enlarged windows for the passengers, the modified aircraft being dubbed 'Viewmasters' . Here is what the McDonald's DC-3 looked like when it was an airliner. Post SPANZ it was converted to be a crop-duster/top-dresser, before winding up here. While the engines are long gone, the propellers can be rotated as you walk past if you are tall enough to grab a blade. Either deliberately or accidentally, they were re-installed in fine pitch (blades parallel to the plane of rotation), minimising the chances of a strong enough wind from the wrong direction setting them twirling pinwheel-like and bopping passer-by. I'm not sure if that scenario is even feasible, but it sounds fun (unless you are one of the ones bopped). Also earning a living in retirement in Taupo is this Russian (probably Soviet when it was built) Mil Mi-8 helicopter attached to a local scenic helicopter flight company base and cafe. A bunch of these were brought out to NZ in the 90's as heavy lift helicopters, mostly for logging operations with varying degrees of success. This one has been parked up near Huka Falls for a while, having wound up a long way from its place of origin. The Mi-8 (wiki) was/is the Russian equivalent of the Huey, only a lot bigger and gruntier. 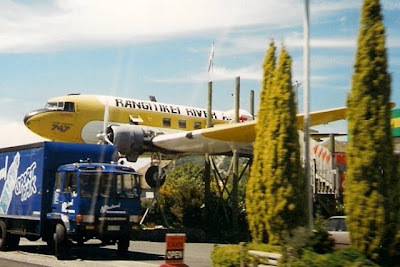 Back in 1999 it still wore the colours of FieldAir (pic), the last owner that actually flew it (minus the Rangitkei River Rats and 747 titles naturally), and one of the companys that used DC-3's as top-dressers into the 1980's. Prior to that it was an airliner for NAC, the National Airways Corporation (wiki) that was the domestic arm and forerunner to Air New Zealand. NAC called their DC-3's 'Skyliners', which has been referenced in the titling on the nose and tail of the new colour scheme. I've been playing around with photographing the waxing moon over the last few days. It is a deceptively tricky subject, and I haven't quite got the hang of it yet. The footage is from Toowoomba in Queensland a couple of days ago. More background here. First you need to find a rocky watercourse downstream from the sluice gates of a hydro-electric power station reservoir. The Aratiatia Rapids on the Waikato River north of Lake Taupo are one of my favourite things. They are dry most of the time, but several times a day the sluice gates used to control the reservoir level are opened and the rapids run again. The gates open for half an hour on each occasion, with the rapids fully developing in less than ten minutes. Once the gates close they are mostly dry again after a quarter of an hour. I've seen them many times and the spectacle of watching them fill, run and empty hasn't gotten old yet. Some blurb about the whys and hows of the rapids is here, with a cool 1960's geological and general description of them and nearby Huka Falls here. * The British manufactured English Electric Canberra B(I).12 (the B(I) stands for Bomber (Interdictor)) was used by the RNZAF as a bomber / attack aircraft from 1959 to 1970, and were replaced by the Skyhawks that ultimately served until 2001. The model represents a Canberra as they looked from around 1964. Incidentally, the Canberra itself is one of the outstanding designs in aviation. One of the first jet powered bombers to enter service, the first one flew in 1949. The last British operated Canberra's left RAF service in 2006. Wiki history of the Canberra here. Evening on Lake Taupo, 06 Jan 2011. We've been camping and chilling and off-line up in Taupo for most of the week. Now we are back home, so normal service will resume shortly. Probably once I can figure out what day it is without checking. I find the action of clipping in oddly reassuring. After a couple of rides with them I am not quite used to the sensation, but have yet to fall over due to forgetting to unclip before coming to a halt. (This is a rite of passage for clipless initiates apparently). Last night was blurry, but in a good way. I didn't want to spend too much time posing or forcing shots, so opted to go for a slightly more impressionistic approach. It was a fun night.